When I posted my resume online in a job board (I think it was CareerBuilder because I swear it’s nothing but a spam-bot farm), I inserted a watermark over my PDF doc that stated “Not Authorized for Recruiting Agency Use”. This wasn’t a visual distraction from the important information on my resume, but it easily made it impossible for *my* original file to be given to an employer without them obviously seeing it was not vetted, plus I like to think it stopped spammers in their tracks because who would want to re-type my entire resume in MS Word? 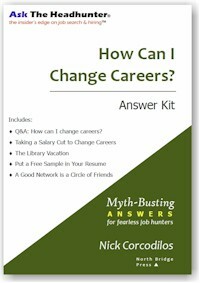 @Kev M: That’s the best idea I’ve heard yet about how to control your resume and job applications. Well, than you! I was worried it’d be seen by people as b*tchy or distracting. But whatever, right? I own the document like an author owns their book. Save the whole thing as a password protected PDF that they can’t even print on paper. If you want to proceed, you can always send a clean copy. About 50% never call back so I can assume they were just fishing. I love it. I’m going to start to send an email back to these trollers and ask them to prove themseleves before I waste any time. I’ve saved the text I want to use so it will be a simple cut and paste. I can’t get too worked up over some hapless recruiters. I have met in-person with professional, local, regarded recruiters that have brought me zero work; I also have received cold calls from recruiters on the other side of the country that led to lucrative opportunities, including my current position. If someone presents a relevant opportunity, feel free to move ahead with them. 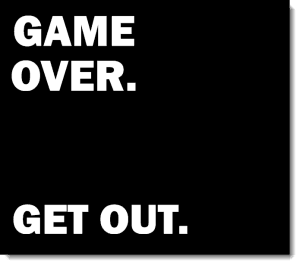 If not, just find your email client’s delete button! The real problem here is poor productivity on the part of the recruiters – I’m astonished how many people have wasted their time emailing and calling me for wildly inappropriate job opportunities, as I’m sure they also reached out to dozens of other bad fits. An underlying point here is that it’s not just about the opportunity itself. How can you even tell there’s a legit opportunity if you don’t know whether you can trust the recruiter? I’m a little late to this party, but I found this site researching Resume Spammers (more specifically JobDiva). 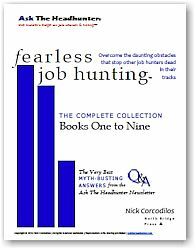 Nick, I read your book when it first came out, and it is a seminal book for job hunting. I was a recruiter for a year as well back in the 90s. It was one of my first jobs out of college. I find that little has changed except the technology – recruiters are often young, inexperienced people who don’t have true understanding of the roles they are trying to fill and don’t have the relationships with the companies they represent to do more than keyword match contract work for hiring managers and HR departments. Unfortunately, a lot of big companies don’t handle hiring contractors, so they put those jobs out into the hands of the agencies. There’s a few good ones out there, but for the most part, even the “legit opportunities” and “decent recruiting firms” still specialize in wasting most people’s time. It becomes a numbers game and a matter of matching specialized skills to a vague job description. Job seekers want a job. 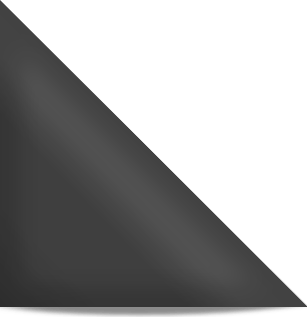 Recruiters want to fill a role. Both parties have blinders on. This all seems like very good advice! My only quibble is for the recruiters out there… I know the best recruiters tend to make a lot of phone calls (in Kris Dunn’s words). I haaaaattteeee phone calls. If you’re a recruiter trying to reach me, calling is the best way to ensure you never do. I can tell if you’re legit or not by email, and it’s not like it’s hard for a hapless recruiter to cold call. I think an increasing number of us (the dreaded Millennials) feel the same way… I am not interested in your calls! Give me some links to look at and the courtesy of allowing me to evaluate on my own time. Bonus: not talking to recruiters on the phone makes me almost immune to the inevitable sales techniques. I’m interested in talking to recruiters who are passionate about matching people with the right positions, not ones who get a rush from closing a deal. I totally agree: it’s easy for me to read between the lines and determine if someone is legitimate without demanding existential proof. If the recruiter has matched me with an appropriate opportunity and writes emails in complete, coherent sentences, that’s a great start. As a fellow Millennial, I usually let calls go to voicemail or do an initial screening based on the intro email, then determine if I will call back (or just ignore). Recruiter calls can also be difficult to take when you’re on site with your current client. I understand your and Ian’s position about phone calls. But if you rec’d a call that went like this, would you ignore it? I’d love to get a call/email like that. I never have. I get about a half dozen emails/calls a day from recruiters looking to fill family physician positions. I’ve NEVER gotten one that indicated they knew me from a work relationship. I’m active on professional online fora, and haven’t gotten any nibbles from them either. Most recruiters have positions from where I lived 10 years ago, or are wherever they have openings. Spam. Great article, Nick! My experience with headhunters has also been mixed. I’m confident in weeding out the totally unsuitable ones, like those who refer to a version of my resume that’s 10+ years old or offer opportunities that are based on one generic keyword from my resume. For recruiters who found me from a current source, your tips have given me a better way to assess whether they’re worth my time. Lately I have been receiving emails from recruiters asking to reply with a resume if interested in what reads as a “tempting” position to apply for. To date, I’ve deleted all. One technique that has worked for me is directly contacting the staff HR recruiter at a target company I’m interested in. This bypasses any contingent recruiter and gains insight to the open positions and possibly even learn who the hiring manager is. @Paul: Ask yourself, why would a recruiter contact you to get your resume? A robot could do that. Why would an employer pay a recruiter to solicit resumes via e-mail. The company’s HR staff can get all the resumes they want online. This is not recruiting. It’s spamming. I usually ask the recruiter who the client is. Most outfits will tell me. For the ones that don’t tell me, I am now going to add your line about giving proof. Thanks Nick for the insight! I’ve been getting emails and calls from people claiming to be recruiters lately. My email provider has been tagging them as spam and sending them to my junk file. I’ve been curious enough to open a couple of them, and they’re so poorly written and so general that I stopped looking and just delete them. The callers all have heavy Indian accents to the point of being unintelligible. The few Americans have refused to tell me who the employer is, at which point I ask him why I should continue to talk to him if he won’t tell me who the employer is or what the job is. How I am supposed to be screened or interview for an unknown job with an unknown employer? So I hang up. Good to know that this isn’t unusual behavior for those who are spamming the universe in the hopes of roping in a sucker. This behavior helps separate the ones who aren’t serious about recruiting with those who are. Good advice, as always. Why are recruiters so hesitant to state who the position is with? I don’t know about anyone else, but there are companies that I will *not* consider. Why should I waste the recruiter’s time listening to a job description, describing my experience, etc., etc. only to find out it’s not a company I’m interested in? Why waste my time? What if I’ve already applied to that position with another recruiter or on my own? 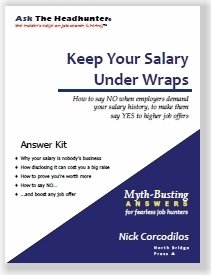 No recruiter wants to get into a fight over fees. And in this day and age, it’s pretty damn easy to find out who the employer is if you can’t already tell by location/industry/etc. A quick online search of a few phrases in the job description will usually give you a hit. And if you can get the hit that way with just a few keystrokes, the recruiter is just shopping a job listing and brings no value to the table. @Chris: The best recruiters have exclusive access to their clients’ positions. There’s little danger that, if they tell you who the employer is, someone else is going to fill the position and earn the fee. And if you’re going to “go around” — well, that’s not likely if I present the opportunity the right way. You’ll WANT me to help you with it. A recruiter who has a solid relationship with his client has no reason to hide the employer’s name. The recruiters you’re bugged with have no exclusive access to those positions, no contracts with the employer, and no reason to tell you anything — because they don’t know who you are, what you do, or whether you’re even a likely candidate. They’re trolling. That’s how you know who to hang up on. And I think many people have been “burned” because the so-called “recruiter” does not have exclusivity – so you basically have Recruiter A competing against Recruiter B competing against internal HR in some cases. The only way A can compete against B is if the client/employer permits and encourages it. I don’t see how this pays off for any employer, unless their HR department believes hiring is a numbers game, and that the more recruiters who submit the same candidate, the better. It’s nuts. While the U.S. Dept of Labor worries about H1-B, the jobs report, and other trivia, the entire employment market has been co-opted and corrupted by industry-wide practices explicitly supported and funded by real employers. It’s long past time for a Congressional investigation into how the employment market operates. I have a standard canned email response where before ANY phone call they must provide 1) the geographic location of the position 2) a COMPLETE job description or link to one, and 3) a salary range, with an admonishment NOT to reply back with another request to call by phone. 50% never reply back, 40% ask for the phone call again, sometimes claiming “confidential” or some such BS, and 10% give me some or all of the info. Especially if there is no salary info, I figure them for listing trolls. If a position holds interest, is relevant to me, and they provide the info, I call back. I also HATE cold calls, particularly to my place of work. I generally shut them down cold. Email me and I’ll assess it myself, thanks very much. I once had an unsolicited recruiter leave a detailed message on my work voicemail system…..which automatically turned it into an audio file and emailed it to me. All emails were also copied to senior management. So you can imagine how irate I was……. @Chris: Sheesh. One dumb recruiter who’s in a hurry to leave all the details because she really doesn’t have time to talk with you again. I got one even better than that. After interviewing with an internal recruiter and hiring manager at a competing consulting firm, the internal recruiter sent me a polite thank-you email note. The email had full details about the position (except the end-user client) and stated that they were still very interested in me for that position. Only problem is that she sent it to my WORK email account. Apparently she ignored my resume and instead used my business card. My employer used a spam processing system that logged message details and selectively sidelined messages for examination. A message from a competitor’s email domain with the subject “you are still being considered” would have certainly caught someone’s attention (besides mine). No job offer and no responses to emails and phone calls to follow-up. And no raises or bonuses where I was working after that. Nice favor she did for me. Sometimes I have responded to these unsolicited emails from “recruiters” by saying that I am retired (which I am). And sometimes I later receive emails from these same people. Just shows that you are dealing with a robot, not a human being! Love the watermark idea! I am an Accountant and I have to sift through my emails to weed out the Auto & Insurance Sales pitches every morning. I’m going on month #3 of job searching/unemployment and about 90% of my Resume views I am able to see on Monster/CareerBuilder/ZipRecruiter sites are recruiting companies, not employers. I have to pay for an upgrade on LinkedIn to see that. Yuck. I had a promising call from Robert Half but they insist I have to fill out paperwork that reeks with the word “arbitration” and includes my SSN first. That’s just for the Temporary assignments. I use my middle initial on my LinkedIn account. The spammers address me in InMails using the middle initial. I’m easy to find if you are a person. Yes! This has been my not-so-secret secret of how I can tell it’s spam! I have a friend named Steve who subscribes to magazines as Zeke — never as Steve. This allows him to identify junk mail because magazines sell names and anything addressed to Zeke that’s not one of his subscriptions goes straight into the trash. And he says almost all his mail now comes to Zeke. CareerBuilder, Monster, Dice, and LinkedIn are all platforms that collude with a massive predatory middle-tier of so-called “staffing” companies (aka body-shops) that either own or hire third party agents that are actually outbound call centers in India that brand themselves as “recruiting process outsourcing” services. They use platforms like JobDiva, which is a profile harvester that downloads resumes from CareerBuilder, Monster, Dice, etc. and then allows the call center employees to use webtools to send out massive spam emails blindly based on token/term searches. JobDiva then strips out the X-Originating-IP (so you cannot determine where the email really came from) and spoofs it with its own mail server’s IP. Many of these “recruiting” companies are owned by Indians who are very familiar with the outsourcing industry and call center industry in India. They setup body-shops here in the states and try to get as many H-1Bs and US citizens as they can to accept W-2 status with them so they can wage scalp them and make a killing in predatory profits. I know because I have seen both sides of the equation, and these body-shops are taking well over 50% of the direct bill rate a majority of the time. The call center’s tell their employees to lie when asked where they are calling from (Identity Deception). They put fake profiles on LinkedIn and even their education data shape-shifts as they go from one client to another even though LinkedIn’s own professional guidelines claim this is not supposed to be done. LinkedIn doesn’t care as these predators are the source of LinkedIn’s bread-n-butter. I have created a technology platform that can stop these scammers and spammers in their tracks. I’m interested to hear about this platform. I’ve been fighting a battle against them as well. I have some details about the operation as well. Please let me know. Even though this conversation is a couple years old, I found it by researching how to stop getting spammed by JobDiva recruiters. I thought there might be a mass unsubscribe utility, service, or technology. I didn’t see one. However, here’s a couple ways you can make it stop. Every one of these e-mails has the words: “Lookup Candidate” as a link in the body of the e-mail. I used gmail to create a filter that put them in a folder I called “Recruiter SPAM.” You can use whatever e-mail system you have to do something similar. I did a search of my inbox and all the ones I deleted. There were over 1,000 of them going back ten years (they’ve gotten much worse this past year). Anyway, they all have the words “Lookup Candidate” in them. I also selected all of them and clicked on “Mark as SPAM.” If you use Google, it is important that you do this as well because Google tracks it and might start banning their IPs or something if everybody started doing it. Another way you can try to block them is that they are all digitally signed by “jobdivabk.com”. So, if you are working with an ISP or mail platform that allows you to block e-mail by what domain signs the e-mail, that will work, too. I couldn’t do that with gmail. After getting hundreds of e-mails for jobs I don’t want in cities I am not planning to move to…..I had to do something. @Matthew: Thanks for posting your suggestions about how to filter unwanted recruiters spam! 1,000?? Sheesh. If they don’t include a STOP link, aren’t they in violation of CAN-SPAM? Hey Nick – each e-mail has an unsubscribe link. Unfortunately, it only unsubscribes you from the specific “recruiting firm” that sent it to you. In my case, that would be 1,000 different companies/domains (although I’m sure they weren’t all unique). JobDiva is a platform, and somehow they get your e-mail and info from either scraping the web or through some job site and make it available to all these “recruiters.” I don’t know how the interface works, but I presume the “recruiter” just queries on keywords and gets a list of e-mails from the database and sends out and automatically generates a constantcontact-like e-mail to everyone that shows up on it. At any rate, I am certain they ARE in violation of the CAN-SPAM act, but that really does nothing to stop SPAM imo. There are recruiters on this thread. Does anyone have any idea how big the “recruiting process outsourcing” industry is in terms of number of outbound call center calling into the US? There are perhaps thousands of shell companies setup by Indians that are nothing but body-shops that are every bit as exploitive as sweatshops or Apple plants in many respects. Most recruiters trying to make a living vaguely know this is going on but have no idea how big it is. It is a $462 billion annual revenues and millions of emails and cold calls (they spoof phone numbers too). Considering that if one reflects for a moment all the deceptive and manipulative use of technology to perpetrate Identity Deception for the purpose of wage scalping workers. I have a list of all the companies doing this (in great detail). In some cases I even purchased their corporate documents to confirm ownership. The same technologies they use to hide their identity criminals use too. This is a really dumb way to engage anyone about a job. It should be illegal and some tried but in the end politicians qua bought and paid for allowed lobbyists insert their loopholes. Check out CAN-SPAM. Not everything is black or white. Sometimes risk has a reward. It is good to have a relationship with a recruiter. If you have no relationship with a recruiter, start using these points of contact to find one that works your industry and specialty. Interview the recruiters. Make sure they are legit and begin an ongoing conversation. Once you have developed a relationship, when contacted by other recruiters you can say you are represented by ABC at XYZ. Call them if they want to consider you for employment. Not all recruiters are scum and not all prospecting calls are for fake jobs. You need to use your instincts and common sense to separate the gold from the sand. There are indeed good recruiters out there — but the industry has such a low cost of entry that it’s loaded with unsavory, inept practitioners. As you point out, it’s critical to tease them apart. 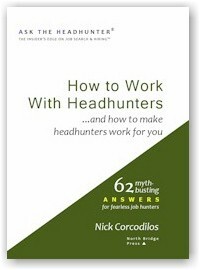 A good headhunter can do wonders for your career. Do you think the standard has changed since your success with that 17-year job? Aligned to your point about recruiter’s angst about client disclosure…you don’t worry about it when you have a solid relationship with a client with standards, who as you pointed out won’t have a problem giving you a letter authorizing you as their rep…if they find that someone, e.g. a potential client has undermined your trust..said person will not be considered. I always disclosed. Also, there’s a broader consideration between recruiters/headhunters and potential clients and candidates, do you even have the bonafides to represent them in the 1st place? When an agency recruiter I was an “IT recruiter” I could back that with 40 years in the IT business…I’d send them my resume. After all, I had theirs or was asking for it. Quid Pro Quo, it’s only fair they have mine. I found very few recruiters did this. recruiting companies would like to think their name is a door opener. Hardly. What average person is aware of the recruiting business and it’s inhabitants. One’s personal background and alignment to the client’s need or the candidates profession meant much more. I would also offer references..other candidates I worked with. And that included some I didn’t place..as you can’t guarantee placement. but you can guarantee professionalism in how you work with people. So when approached by a recruiter…don’t hesitate to ask them for their background, a resume, (yeah you can go to linkedin, but asking is a test of faith, a mini interview) and their company, and if you want to really have fun, their process..how you were found, how they work? how their managed.. Ask questions that they likely will ask you. An accomplished, proficient headhunter with a solid track record in your field will have no problems with this. I wish I could say I didn’t this constantly…but I’d try to avoid having a client or candidate having to track me down to find out status…I’d send them status reports. This was well received. But I worked in some boiler room processes at times, leaving me about no time to do some decent things. Which I fixed when I became an in house recruiter. Don: A new twist today is job shops, contract houses, consulting firms, etc. They are not the employers where a person will show up for work, but they are employers because you’re on their payroll. They are not recruiters, because they’re not independent of an employer — yet they recruit. The problem they create is that they solicit haphazardly and waste everyone’s time. The only stop-gap is the real employer, the client, the HR exec who uses these services. As long as they tolerate their behavior, everyone will continue to waste time. It seems these employers don’t really care. Yet, at some point, there’s a real manager in charge of real work that has to interview and approve these “arm’s length” workers who actually get paid by the job shop. So, where does the buck stop? I’m convinced that recruiting has been irreparably corrupted by these companies and the drones they call recruiters. I’ve been reading your newsletter for a while – thank you for doing this! As a recruiter – headhunter – and agency owner with over 30 years of experience, I find much of your material refreshing and generally I agree with most of your points. This is the first time though when I feel that your advice “Be ready to disclose what company you’re recruiting for” may not serve a job seeker well. I work in the cleared high tech arena in the Washington DC area. Ours is a small community. Many positions we get, especially at a high level – are confidential. Companies prefer not to disclose the fact that they are searching to fill a certain position or replace a current employee. They turn to a 3rd party for screening, as well as for the confidentiality we offer. You may want to consider this when you make your recommendation to a job seeker. Once the candidate is vetted AND INTERESTED in pursuing the opportunity, we will disclose the company’s name. As I am also, generally speaking, a proponent of full disclosure and transparency in the work we do as headhunters, I’ve also been “burned” a couple of times when candidates sent their resume directly to my client. While this was unpleasant, it certainly did not lead to this unethical candidate getting the job. I made sure of it! I hope this comment will help some of your readers, and thanks for your newsletter! Vicki: I’ve done many projects like yours – where confidentiality in a small community is necessary. But it’s a pretty special case, and an article can be only so long. Nonetheless, it’s something readers should be aware of. My goal with ATH is to help improve job hunting, recruiting, hiring – and what’s broken is so serious that I sometimes err on the side of nudging people to think, to raise their standards and expectations, and their behavior. I think most searches are not confidential, and I think most good recruiters would be much better off if they disclosed more in an effort to distinguish themselves. Job candidates are so fed up with poor recruiter practices – and I’m trying to stoke the fire, push the debate, and hopefully help everyone come up with better standards of conduct. So I left a hole in the article, and you found it ?. I’ve been burned like you’ve been more than once. But I’ve lost more fees to fast-talking recruiters who “stole” my candidates and placed them in the wrong jobs by misrepresenting themselves, their “clients” and the deal. But by the time the candidate figures it out, it’s too late. So I made the decision to focus on a more general, bigger problem. Hope that makes sense. But you tell a compelling story about a more unusual side of the biz. Thanks for posting it! ‘Should’ I be annoyed with recruiters call or email my work contact info (which is not posted anywhere)? I expect to be contacted through LinkedIn or my gmail address, which is on my resume. I’m not sure if I’m being extra sensitive. Thanks! YES! I’ve had recruiters stalk me and find my work contact information despite me NEVER releasing that on my resume. I tell them right where to go. That sort of behavior is worthy of an instant blacklist; do not pass go, do not collect $200, go straight to jail. When they call me I shut them down flat with a “My company monitors all calls and email. Do not contact my at my professional contacts again. There are other ways to link in.” It may be profiling but if they have an Indian accent I don’t even talk, just hang up. Over the years, I actually created a list of recruiters I will never speak with again having them burned me/lied/unprofessional/ put me through video interviews etc in the past. They still continue to call and contact me through email or LinkedIn. I just had one recruiter reach out to me on LinkedIn and he was on my “unprofessional recruiter” list. He never called me about this “perfect fit” job months ago and now he expects me to speak with him about another job with no info given at all. Not interested. Then there are those recruiters that get you on the phone only to ask if I can recommend someone for the job. Huh? So you don’t have a job that fits my background after all and you lied just to get me on the phone to get a referral? Ugh no. I had recruiters tell me the job is remote but then I find out in the phone interview you must move to the company’s state and just wasting my time and the company’s. So many stories to tell it would take volumes to write. I would like to see recruiters use real phone numbers in their spam emails. I received an InMail from one who had apparently typo’ed on their contact information. I called the number provided and the unfortunate lady on the other end understandably annoying at being overwhelmed with calls from job hunters who were reponding to the spam posting from the recruiter. I guess I’ve never worked with a legitimate head hunter. I hope to have to opportunity before I retire.